In 2017 AMD released its Ryzen line of processors, but it didn’t stop there. Later that year, AMD launched three impressively overclockable high-end desktop CPUs – named ‘Threadripper’. AMD didn’t stop after launching the Threadripper 1950X, however. AMD followed that up with the Threadripper 2nd Generation processors, spearheaded by the 2950X and 2990WX. These processors were incredibly powerful, even leading AMD to suggest that cryptocurrency miners use these HEDT chips instead of graphics cards – a credit to the high compute power on offer. Later this year, we’ll likely get Ryzen Threadripper 3rd Generation chips, based on AMD’s new Zen 2 process. These HEDT processors, thanks to their smaller manufacturing process will create a wider performance gap than what we saw when Ryzen 2nd Generation followed Ryzen. We’ll likely see much higher core counts, not to mention clock speeds. So, here’s everything you need to know about AMD Ryzen Threadripper – from the release date to prices, even performance. And, as always, be sure to keep this article bookmarked, as we’ll update it with any new information that comes our way. AMD Ryzen Threadripper first two processors the 1950X and 1920X arrived on August 10, 2017. 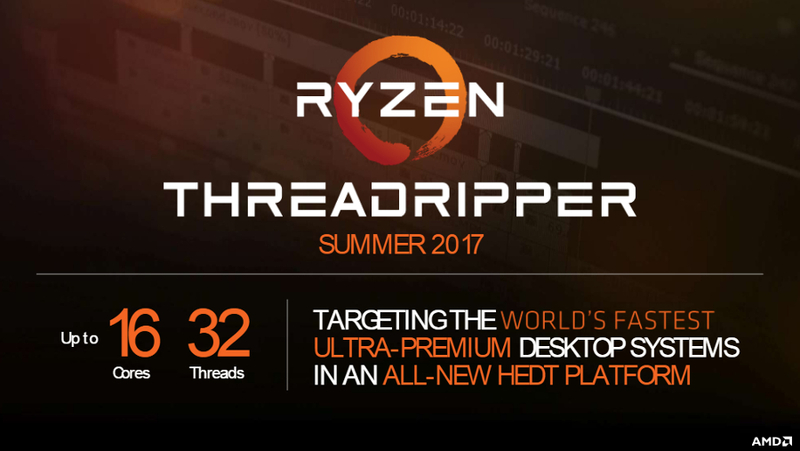 While AMD’s entry level Ryzen Threadripper 1900X came out a few weeks later on August 31, 2017. And, it looks like AMD Ryzen Threadripper 2nd Generation followed in the first’s footsteps – the AMD Ryzen Threadripper 2990X launched on August 13, 2018 with the rest of the high-end CPUs coming in the following months. AMD isn’t going to slow down, either, AMD is planning on supporting Threadripper with new chips until at least 2020, according to some leaks. At long last, we now have firm details on what price the AMD Ryzen Threadrippers will release at. They’re not cheap, but you can expect to pay less for more performance than you would get with a comparable Intel chip. The prices of all the AMD Ryzen Threadripper processors as they launched are as follows. As for the competition, Intel’s closest competitor to the 1950X, the Core i9-7960X will set you back a whopping $1,699 (around £1,315, AU$2,200). The Threadripper 1900X’s closest octa-core competitor from Intel is the Core i7-7820X at a much more reasonable $599 (£529, AU$869). To put this into perspective, the Intel Core i9-7960X has packs the same 16-cores and 32-threads as the Threadripper 1950X and so on and so forth with the Intel Core i9-7920X vs Threadripper 1920X and Intel Core i7-7820X vs Threadripper 1900X we&apos;ve setup. However, now that the Ryzen 2nd Generation has made it to market, you can find about 10% better performance in the Threadripper 2950X – with a lower price tag. Making it a great option for aspiring PC enthusiasts. The Threadripper series uses AMD’s SMT (Simultaneous Multi-Threading) technology found in other Ryzen chips. Finally, the Ryzen Threadripper series processors uses a TP3 socket, which is a modified variant of the SP3 socket originally designed for AMD’s beefy server chips that go up to 32-cores.